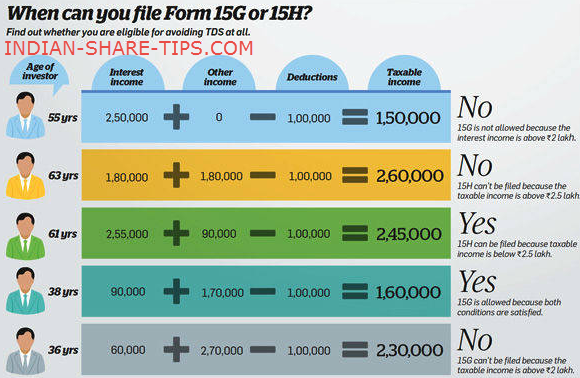 How Filling Form 15G/15H Form Saves You Money? It is important that if you are maintaining Fixed deposit with banks or post office make sure that you update the form 15G or 15H for senior citizens to the bank branch or Postofffice. You can even download these forms from the bank website. This form submission orders a bank not to deduct the tax on interest. Make sure that you submit if you feel that interest income is going to be more than Rs 10,000 from the fixed deposit in a financial year. As a matter of fact make sure that you submit the form 15G or 15H at the branch ideally at the beginning of the financial year or if a deposit is made during the financial year then as soon as the details about the new deposit are available. Check who should fill form 15H here. 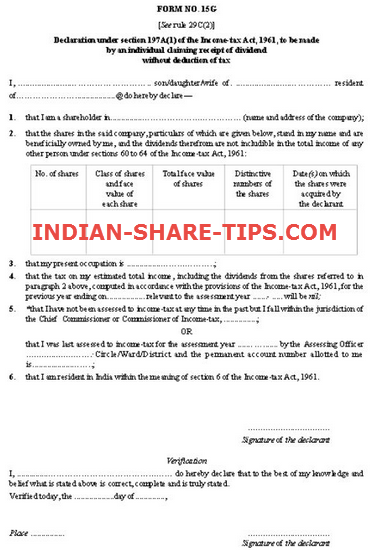 This way one can maximise the returns by submitting the requisite forms. If TDS is deducted by the bank on interest; then one will find that all those in highest tax bracket may get the returns less than inflation rate which may not be good for your financial health. Even same is also applicable for receipt of dividend income and now after filling the form the onus lies on the individual to report that income in his taxable income. Bookmark us for best income generating tips and make money like professionals using best intraday tips and make money making a daily habit.